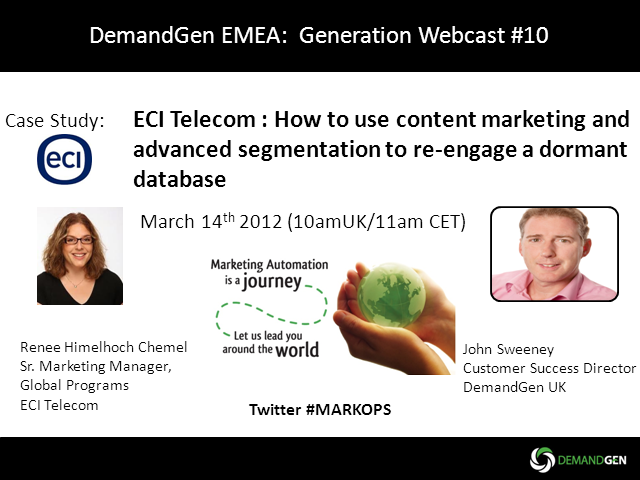 Join DemandGen for another close up study of Marketing Automation in EMEA. Renee Himelhoch Chemel is a marketing automation and lead-gen advocate with a passion for driving high quality leads to the sales organization. As part of the centralized Corporate Marketing team, she is responsible for prospect and customer engagement. With almost two decades of high-tech B2B marketing and communications experience. Renee is a true believer in face-to-face marketing for the complex sales cycle. A re-engagement program is a little like a first date. When you reacquaint yourself with someone, usually, your first statement wouldn't be, "Hello, I love you. What's your phone number?" That would be too forward and scare people away. Instead you want to offer the person something interesting about yourself that would engage him/her in conversation, or ask them a question to get the conversation started. By doing a little online flirting, you offer your potential customers a way to get to know your company. By offering your audience an incentive, content, which is part of your market positioning, you begin that first conversation. As that conversation progresses you also begin to profile your customer with advanced segmentation. A re-engagement program is the first step in getting to know your customers better. Jump in and get started, because maybe if you're lucky - you will have them at "hello".